The product is applicable for training and examination of intraocular pressure measurement with Schiotz ophthalmotonometer. It supports trainings of intraocular pressure measurement techniques, measåurement weight changes and meter inspection skills. It is able to wirelessly connect the model via QR code scanning through mobile terminal. No need to install any software on mobile terminal which could be mobile and tablet. It supports both ISO or Android platform. Users could separately set up left and right intraocular pressure via mobile terminal, intraocular pressure ranges from 0 to 128mmHg, set the precision as 1mmHg. 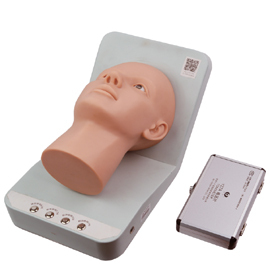 There is built-in lithium battery, which is applicable for training and examination of outdoor intraocular pressure measurement.